This mod is intended to add large amount of various precious furniture elements, decorations of different course and exterior stuff. The mod title itself doesn`t say about all components are luxurious, because there is still simple style of the furniture. Just it says about the enrichment of diverse furniture (kitchen, bathroom, living room, bedroom, corridors, exterior and decorations) and each one with different styles! Currently the mod presents you a few sorts of chairs, tables. It also contains one style of kitchen, armchairs, sofas and footstools. Note, not all items are craftable, unfortunately. Notice:the most furniture stuff are missing now and also there`s no any decorations and exterior that i planned to add in next releases. 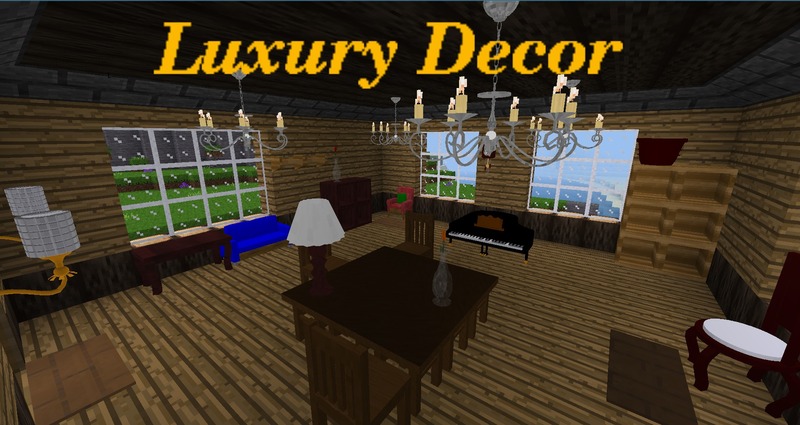 + "List of crafting/cooking recipes"
"luxury_decor:jungle_wooden_plank", "luxury_decor:jungle_wooden_plank", "luxury_decor:jungle_wooden_plank", "default:stick", "luxury_decor:jungle_wooden_plank", "default:stick"
Here is a list with planned stuff below that considered to be added in next updates. Make animations of opening/closing cabinets smoother. Add chandeliers and candlesticks of different sorts. Add curtains/blinds of different sorts. 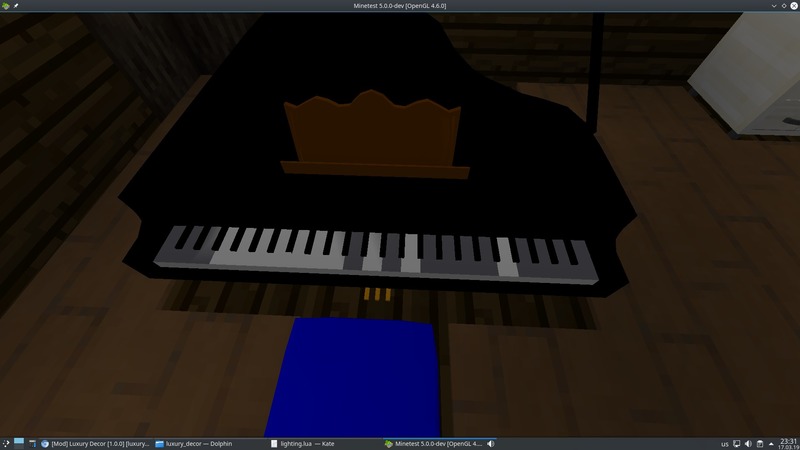 Add a possibility to play pianos. Add a possibility to grow flowers in the pots. Add decorations of different course. Add exterior stuff (summer tables, chairs, char grill, umbrellas and etc). Add doors of various styles. Add wardrobes/cupboards and ingredients for their building. Add more sorts of tables/desks and chairs. Add more sorts of sofas/footstools and armchairs. Add wall papers for different rooms and wall/floor tiles for bathrooms/kitchens. [16.04.19]Release 1.1.1 - Fixed wall glass lamp and simple plastic chandelier models, reduced scale of brass candlestick with three candles. 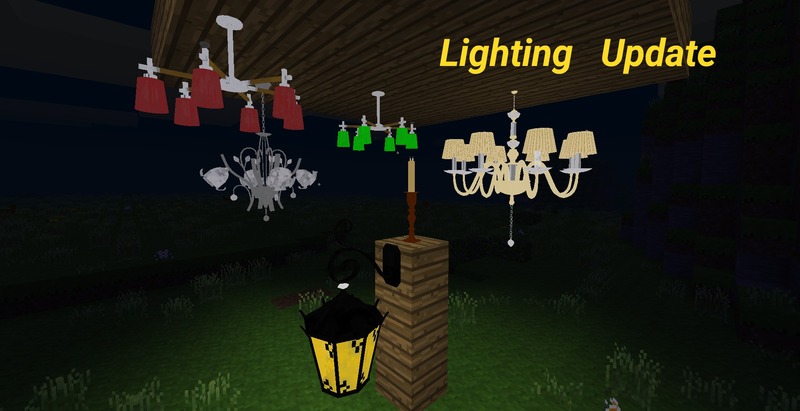 [15.04.19]Release 1.1.0 - Lighting Update: Added 3 chandeliers, 2 types of brass candlesticks, plastic desk lamp and 2 types of lanterns. 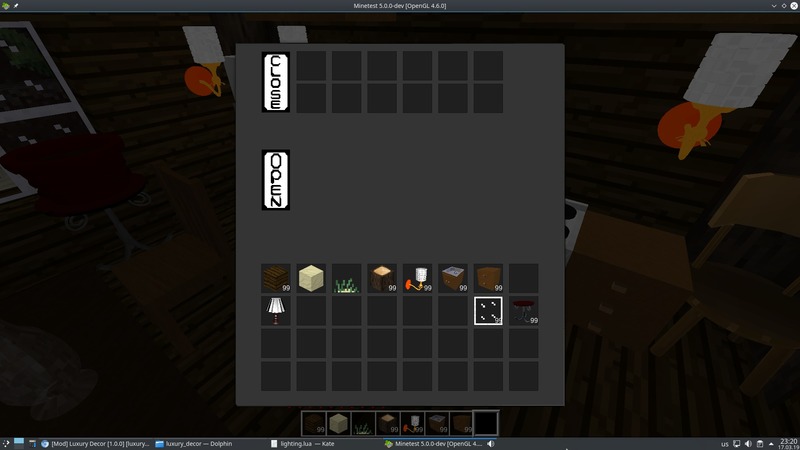 [31.03.19]Release 1.0.2 - Added crafting recipes for all items, added more crafting ingredients. 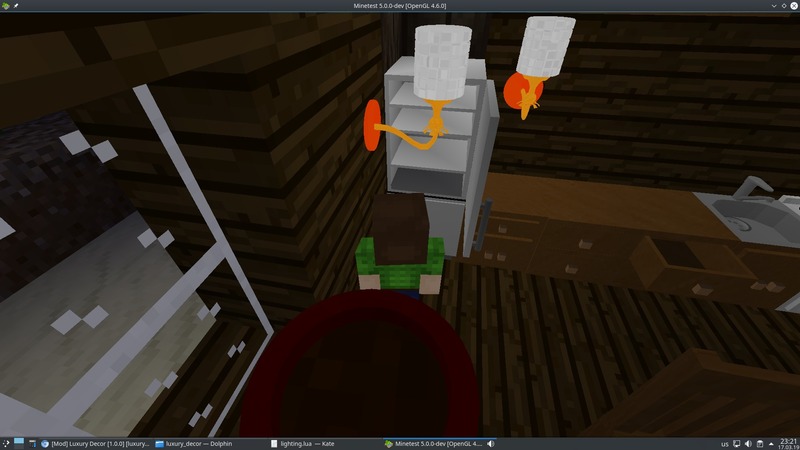 [27.03.19]Release 1.0.1 - The sofas connects correctly, the ones are disconnectable, fixed a problem with the sofas textures laying out. Last edited by Andrey01 on Sun Apr 21, 2019 06:44, edited 15 times in total. Adjacent sofas disconnect now if destroy connected one. 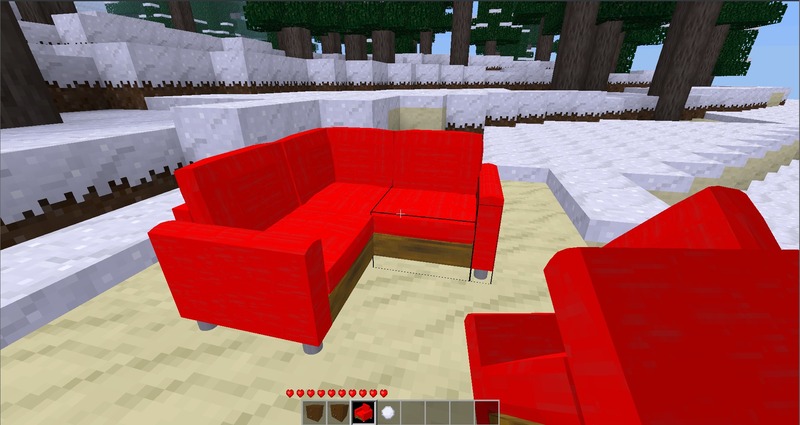 The sofa textures lay out correctly now. 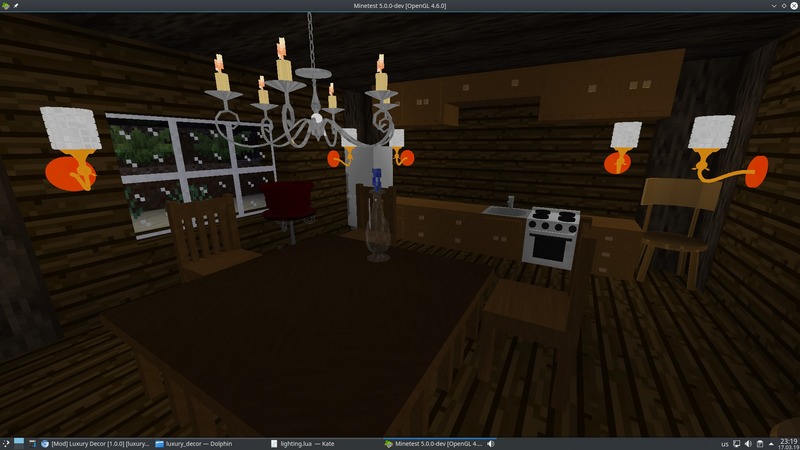 Inocudom wrote: This mod will fit right in with homedecor, ma_pops_furniture, and xdecor. The more the merrier I always say. Probably yes. However, the mod is still very WIP and many features and the most furniture components that i planned are missing currently, unfortunately. A question to the community: should i remove .blend files from the git source as they are overweighty? keep them available for others to learn! maybe put them zipped into a doc folder? I can't get the sofas to connect. twoelk wrote: keep them available for others to learn! Good idea. I`ll zip and put them into "models" folder. GamingAssociation39 wrote: I can't get the sofas to connect. Did you try to click by the sofa to the sides of the sofas? It should work certainly. Wouldn't it be possible to try to detect where the sofa is next to when you place it so it automatically changes when you place extra sofas down? 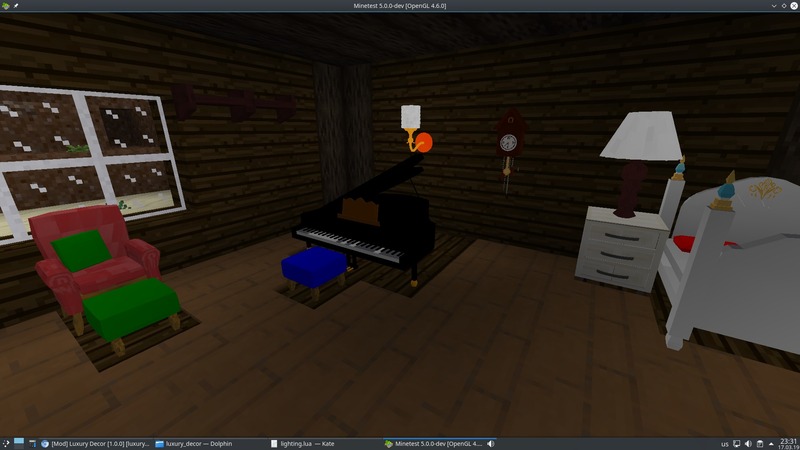 GamingAssociation39 wrote: Wouldn't it be possible to try to detect where the sofa is next to when you place it so it automatically changes when you place extra sofas down? No, the mod has other connecting system. Sofas will be connected between themselves if click on one side by sofa item. I think it is more appropriate, let a player wants to place a single sofa near other one and doesn`t want the sofa to be connected to nearby one. 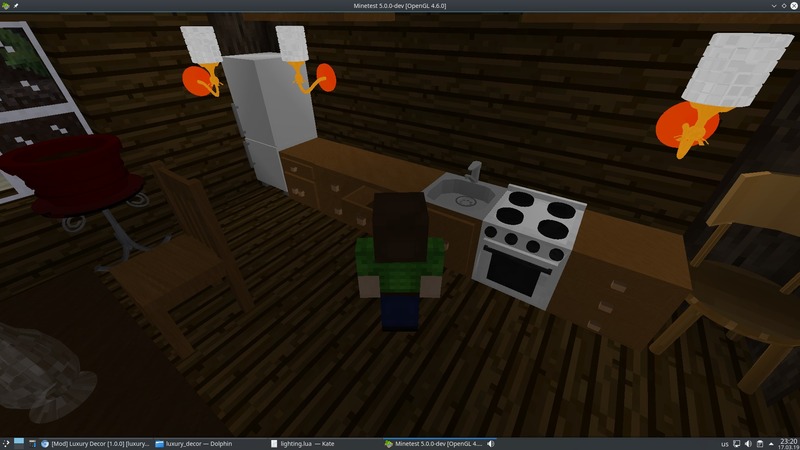 Added more crafting recipes. Now ALL items are craftable. Added oil and wolfram mineral. Also, all .blend files have been archived now into the separate folder 'blend' of their heavy weight. Added 3 new chandeliers (royal brass, luxury steel, simple plastic), wall/ceiling lanterns, brass candlesticks and plastic desk lamp. Plastic Desk Lamp and Simple Plastic Chandelier can be painted with any dye to the corresponding color by right click it. Royal Brass, Simple Plastic, Luxury Steel chandeliers, Plastic Desk Lamp can be switched on/off by right click it. 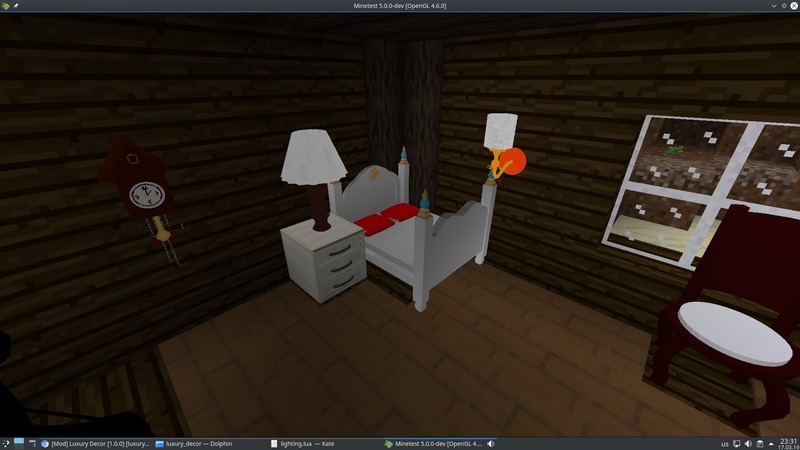 Added more crafting items (lampshades, scissors). Fixed Wall Glass Lamp model, now it has got looked like properly. Fixed Simple Plastic Chandelier model, it has laid out the texture properly. Reduced scale a bit of Brass Candlestick with three candles. Removed .blend files from the source as they annoyed much in the development process. even if they have a CC0 license or similar, it is a nice gesture to give credit and often a link to where they were obtained... it spreads the love. I can, but the thing is i need to archive the .blend files again each time when i change them (for example, when set correct position minetest to render it properly or rotation or just add new ones) to allow to weight them much less for usage. Obviously, this is very annoying. That`s why i had to remove them. 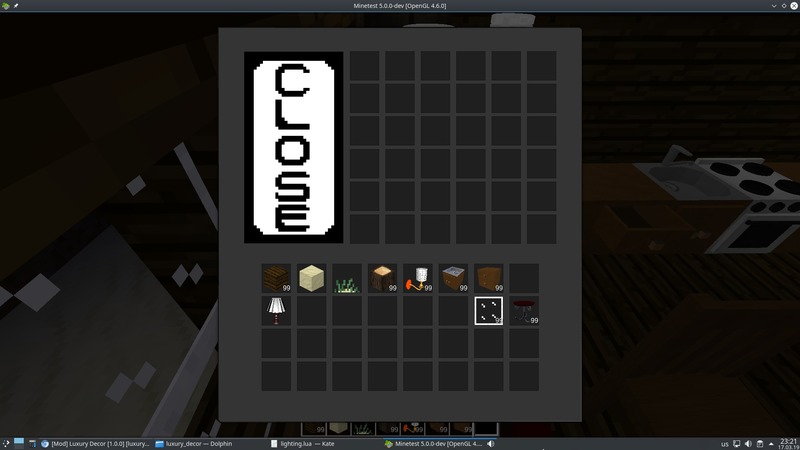 I misunderstand you... code, textures and including models have MIT license. Why do you say they don`t have any license? Removed the poll. Next update will be dedicated to carpets, curtains and cornices.